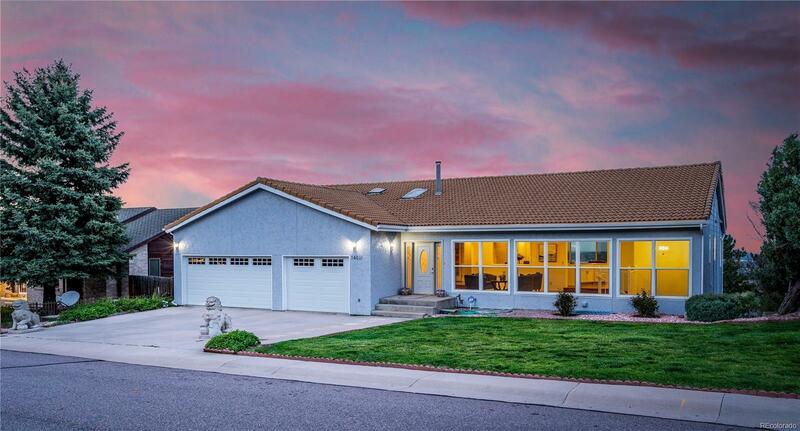 Amazing 180-degree city & mountain views from this special Ranch style home with walk-out basement. Completely remodeled 4 bedroom, 4 bath open floor plan features: vaulted ceilings, skylights, brand new kitchen with granite counter top, 5 door refrigerator, Large Master suite w/ incredible master bath complete w/glass-block shower & private deck to enjoy the views, plus a loft. Another full-length deck from the living room to provide the enjoyment of the views from either outside or sit by the fireplace inside the home. High-quality hardwood floor and hotel style carpet throughout the whole house. New lifetime warranty windows, New AC & furnace, Fully finished basement features: guest suite, big family room with marble floor, wet bar & pool table, utility room, huge storage room. Easy access to light rail, Green mountain open space, trails, mountain biking, hiking, restaurants, shopping, 15 minutes to downtown Denver and/or the mountains.